I’m going to put it out there right at the start: the ColcaSac Kindle Sleeve isn’t the most attractive Kindle case out there. It’s not made of soft, fine leather, or have a fancy designer name. But is that what’s most important in protecting your precious Kindle? 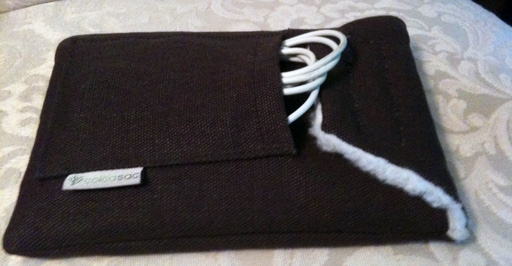 ColcaSac is a company in Utah that makes handmade sleeves for Kindle, MacBook, iPhone and iPad. We spend a lot of money on our technology, so it’s important that it’s protected. My ColcaSac Kindle Case fit the bill nicely. Recently, my husband and I went on a cruise. We flew to the Orlando Airport, took a bus to Port Canaveral, then boarded the ship. What a perfect time to test the effectiveness of the ColcaSac Kindle Sleeve. My poor Kindle, inside my backpack, was jostled through airport security and shoved under airplane and bus seats. Less than ideal circumstances for such a delicate device. Yet my Kindle survived its journey unscathed. The ColcaSac Kindle Case holds the Kindle securely, so there’s no bouncing around within the case, but not so tight as to have difficulty removing the Kindle. The 100% polyester sherpa fleece lining protects the screen and gives the entire case a bit of cushioning. A Velcro closure keeps the case firmly sealed, and an exterior pocket conveniently holds the Kindle charger, so no more searching your home for yet another missing cable. My only problem with the ColcaSac Kindle Sleeve is more of a personal issue. When using this case, the Kindle has to be removed to be read, leaving it with no protection or covering. My previous Kindle case was a flip-top case, similar to a steno pad. While reading on the Kindle I could flip the top over and tuck the closure in to make a stand. Plus, the Kindle never left the case. It would be great if ColcaSac could design a Kindle case where the front of the case could be opened for reading. That would give Kindle users like me the best of both worlds – protection and accessibility. For now, I’ll use my previous Kindle cover around the house. Whenever I travel with my Kindle, it will definitely be housed in its ColcaSac Kindle Case. The ColcaSac Kindle Case comes in two styles of hemp, two styles of burlap, one durable cotton canvas, and all are handmade. ColcaSac is an environmentally conscious company, and donates 1% of all sales to purchase land in environmentally sensitive areas. Your articles are amazing and always lead me in the right direction! Thank you.